Details & phone will be sent to the ones who confirmed attendance one week before. 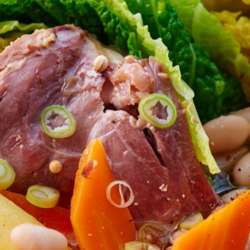 This traditional "Gascon" soup comes from Béarn in the South-West. Very nourishing, it is composed of various seasonal vegetables without forgetting cabbage, beans if possible "tarbais" and candied meats, all left to simmer for a long time under the lid. On its own, the garbure is a real meal. Formerly, in the countryside, it was very common to "chabrot" by rinsing the bottom of his plate with a little red wine and drinking directly to the plate. A hearty dish that I recommend "warmly" for the winter.